This page contains information and pictures about Large Bagworms that we found in the Brisbane area, Queensland, Australia. 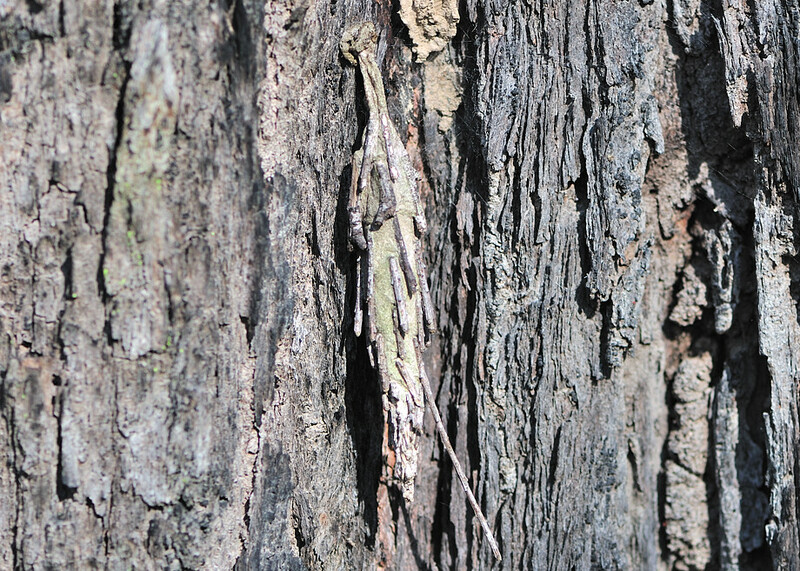 Large Bagworm is actually a case moth caterpillar. The caterpillar lives in a mobile case. The case is made of silk and host plant materials. When grow up it will turn into moth which is known as Saunders' Case Moth. 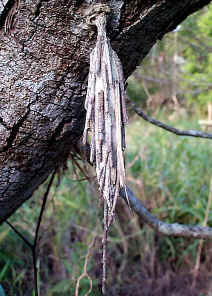 Large Bagworm is a large caterpillar with 10mm in cross section diameter. Its body is orange-brown in colour with black patterns on thorax. 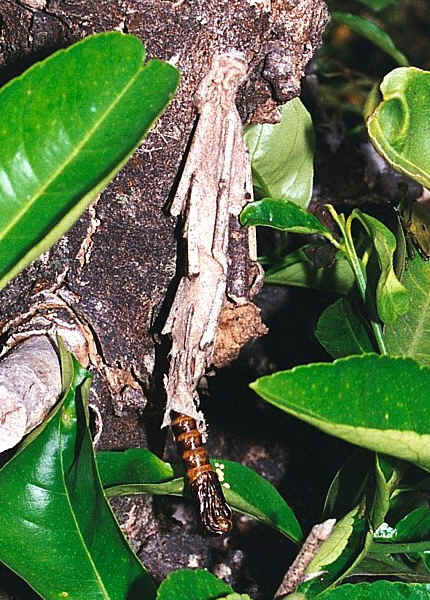 This Large Bagworm is common in Brisbane backyards and bushes. The caterpillar builds an elongate soft case. Short pieces of twigs are attached to the outside of the case. Those twigs are attached to the case only at one end. The case moth pupates within the case. 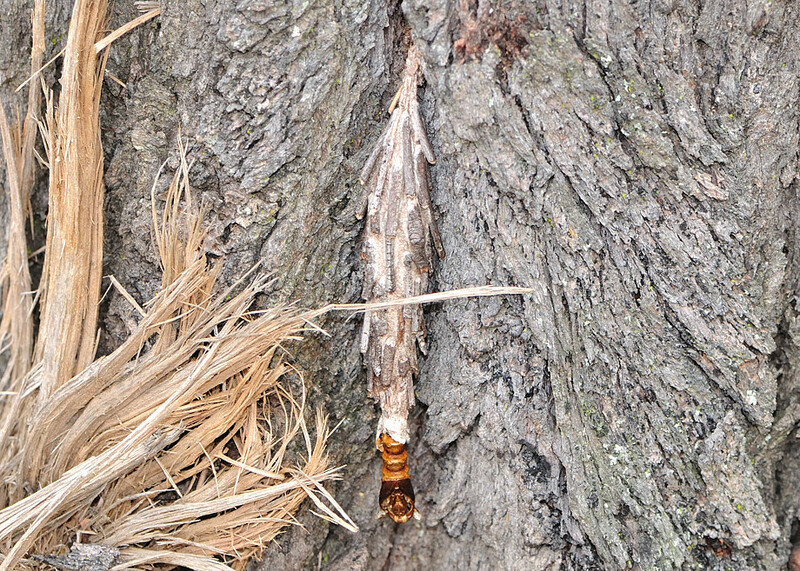 It hangs the bag to a twig and secure with silk The second picture shows a moth had emerged through the bottom opening and left the empty case. 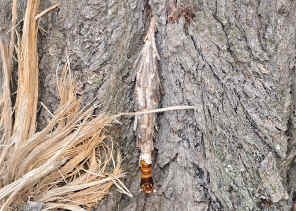 We found the above case moth caterpillar in early summer 2002. 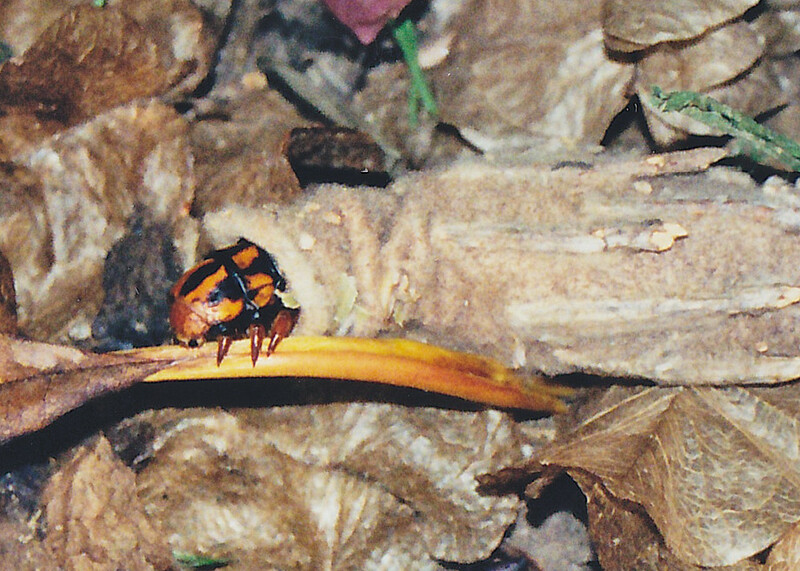 It was feeding leaves on a palm tree. We kept it for a few weeks. It fed during the evening everyday. 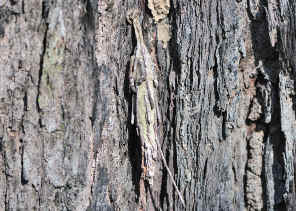 It fed on most kinds of plants leaves, including Gum tree and Wattle leaves. 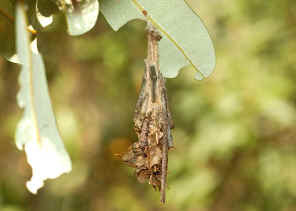 When disturbed it retreated back into its bag. The bag had two openings, one at the top and one at the bottom. At top end it came out for feeding. At the bottom end it dumped its waste. 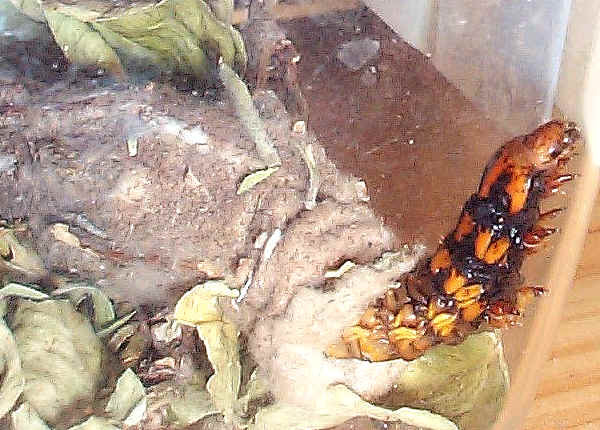 We kept it until it turn into a moth. Unfortunately we did not take the moth photos. For some reason, the owner of this bag changed its way on making the bag during it development. 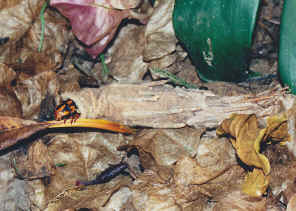 Half of its bag is made if small sticks and half is made of dry Banksia leaves. 1. Moths of Australia - I. F. B. 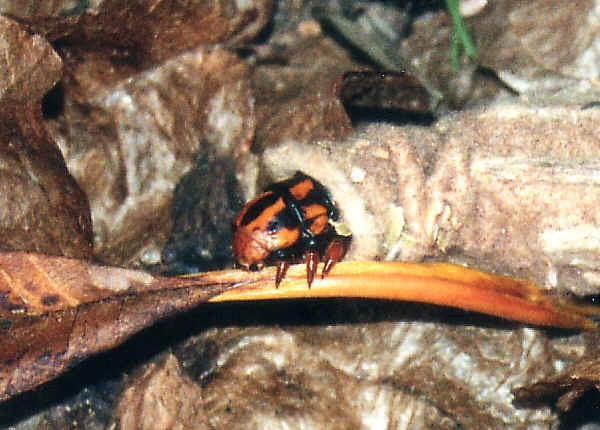 Common, Melbourne University Press, 1990, plate 51.5 (Oiketicus elongatus). 2. 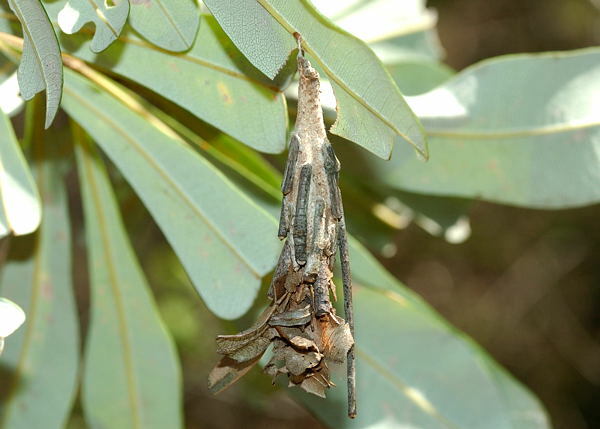 Metura elongatus - Caterpillars of Australian Moths - Don Herbison-Evans & Stella Crossley, 2007. Last updated: July 30, 2011.